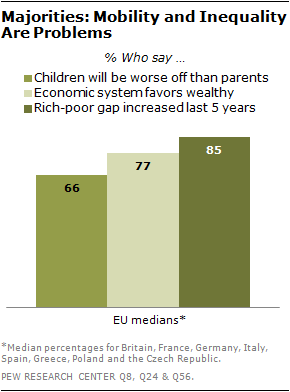 Most Europeans are profoundly concerned about the state of their economies. 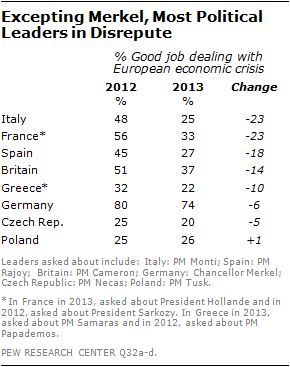 Just 1% of the Greeks, 3% of the Italians, 4% of the Spanish and 9% of the French think economic conditions are good. 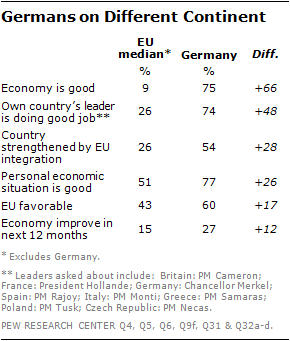 Only the Germans (75%) are pleased with their economy. Europeans are of two minds about public debt, which has been at the center of the debate over the euro crisis since it began. 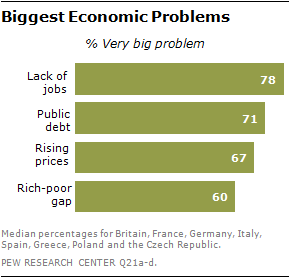 A majority in six of the eight countries surveyed consider debt a very big problem. When pressed to choose between reducing public expenditures and more spending, most publics choose the former, even in Spain (67%) and Italy (59%), despite the fact that people there have already experienced cutbacks in government spending, economic contraction and record high unemployment. 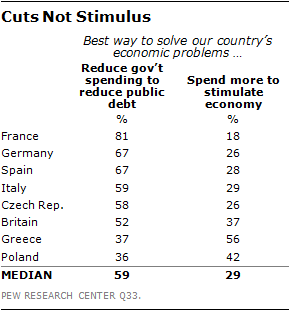 Across Europe a median of 59% believe that reducing public debt is the best way to solve their country’s economic problems. But a median of only 17% think debt reduction should be their government’s number one economic priority.